What to do with Bunions? What to do with Bunions? Better to leave them alone. A bunion is a characteristically large bony bump at the base of the big toe. This alters the alignment of the bones, causing the base of the big toe to angle out and crowding the tops towards the smaller toes. Bunions can often be painful and cause swelling, making it difficult to find comfortably fitting shoes. The big toe pushing against the smaller toes can result in irritation of the skin, forming painful calluses. Bunions occur more frequently in women and can occur in children as well. Although some footwear can contribute to the deformity, it is not the sole cause. “People who develop bunions often have an underlying predisposition to acquire them, such as a family member who may have them, overly mobile joints, or a disease such as rheumatoid arthritis,” explains Dr A Holly Johnson, Foot & Ankle Surgeon at the Massachusetts General Hospital and Instructor at Harvard Medical School, Boston, MA. Traumatic injuries to feet or toes can also result in bunions. Bunions can occur in people with flatfeet (or over pronation) and may involve deformities of the smaller toes, such as hammer toes. 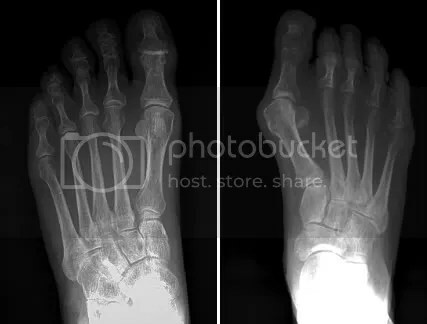 Left: X-ray of normal foot while standing. Right: Foot with a bunion, also called hallux valgus. Notice the bony protuberance and the large angle at the base of the big toe. The top of the big toe is seen crowding towards the smaller toes. Not all bunions are painful. Many people don’t have any symptoms. When a bunion causes discomfort, most people experience the pain at the bump itself where it is squeezed by a shoe, in the ball of the foot, or even in the second or third toes. The bump can become swollen and red, and sometimes the big toe can become numb. Walking can often trigger the pain. The best way to treat a painful bunion is to wear well-fitted shoes. Wide shoes with soft leather or synthetic materials that accommodate the bump and don’t cause pressure on the sore spots provide immediate relief. For exercise and walking, use wide, cushioned sneakers. Pointy-toed, narrow shoes not only make symptoms worse, but can add to the deformity. High-heeled shoes often exacerbate the symptoms, as well. Strapping, taping, or splinting the big toe may help relieve symptoms in the short-term, but will not provide long-term benefit or change the alignment of the foot. When bunions remain painful despite appropriate shoe wear, surgical correction may be necessary. “Cosmesis is not a reason to undergo surgery,” cautions, Dr Johnson, “surgery is reserved for those patients who have pain that limits their activities of daily living, work responsibilities, or exercise.” Operations for bunion correction vary depending on the surgeon and type of deformity. During surgery, the deformed joint is corrected by breaking and resetting the bone in a straighter position . A full recovery can take up to 3-6 months. I am relieved to know that a bunion NEVER calls for a biopsy. Could you please give me a reference to the toxicity of silica? Silicea is a first line of attack for such disorders in biochemical medicine! Do you think that silicea can help, especially if people take it at or near the outset? I also feel that a biopsy should be considered by a primary care physician, though it will not be relevant in cases where ill-fitting shoes are very probable reasons. I don’t think there is any basis for using silica ~ actually it is quite toxic to the body. An NO reason for a biopsy either. it is a commonly occurring excess bone. Happens all over the body as a response to irritation and sometimes trauma. Best is to leave it alone. And yes, trick is to wear comfortable shoes, sandals, etc.